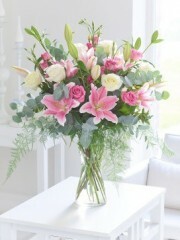 The lily is an exquisitely beautiful flower and it is of no surprise that it is considered one of the nation’s favourite as it is used in bouquets and arrangements for all sorts of occasions ranging from birthdays to anniversaries all the way to larger scale occasions like weddings and funerals. This lovely flower comes in an array of different species with the two most common types being of the oriental and the asiatic variety which is what the Edinburgh florists tend to work with the most but there are others such as calla and Madonna lilies. The asiatic and oriental lilies both come in a range of colours from whites to pinks and reds that can be used in arrangements for different occasions however it is entirely up to you, the customer, to select what arrangement it is that you want and what the occasion is. 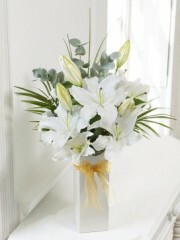 Whilst white lilies are classy and can be used in formal and elegant functions as well as weddings, they can also often be used at funerals as they are simple in their appearance. Other colours such as yellows and reds are often seen in autumnal floral displays as they create a vibrant appearance when mixed with other tonal colours. 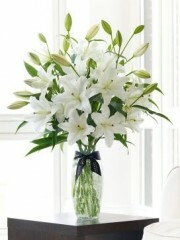 Oriental Lilies, have a far more elegant nature and once in bloom have a very strong fragrance. 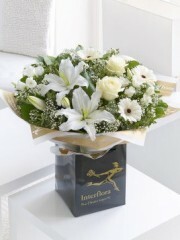 Browsing our Edinburgh flowers online selection, it is evident that they make wonderful gifts, especially if you look at our lily scented vases and our wonderfully white hand-tied, alongside our exquisite arrangements. 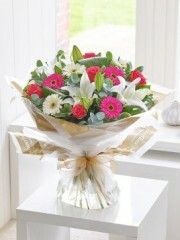 If you have any further queries, please do not hesitate to get in touch with Edinburgh flowers either by phone or email and a member of our team is always available to answer any and all of your questions. If there is nothing up on our website that quite takes your fancy then don’t worry as all customers are offered the bespoke service. 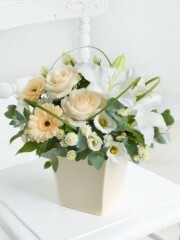 This service allows you to either alter elements of a pre-existing arrangement or bouquet from the website or alternatively, you are able to create a completely new and unique floral design. Using the bespoke service you are able to specify any colour schemes that are preferred; what flowers should be used; what flower should be avoided; what sort of finish you’re after and so on. Once the Edinburgh florists have all the details they require, they will arrange a floral design that turns your ideas into a reality. You are able to ask for any design and any form of floral design which includes the bouquet, the hand-tied bouquet and any arrangement. 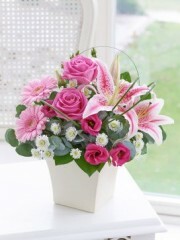 Floral arrangements come in either a lovely vase, box, basket or even a teacup depending on what sort of aesthetic you’re after. The bouquets all come wrapped in gorgeous and complementary papers, tissues with ribbons binding the loose stems together so the flowers will keep their perfectly rounded dome-like formation. 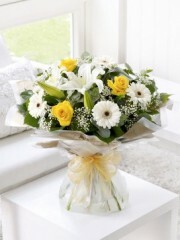 A hand-tied bouquet differs in the sense it comes with a cellophane bubble filled with water to keep the flowers hydrated so this type of bouquet is perfect for those who are perhaps too busy to look after flowers or maybe are on the road to recovery. Customer satisfaction in the number one priority at Edinburgh flowers which is why we want to provide customers with as many services as possible so we are able to accommodate to all of your needs and tastes as fully as we can.